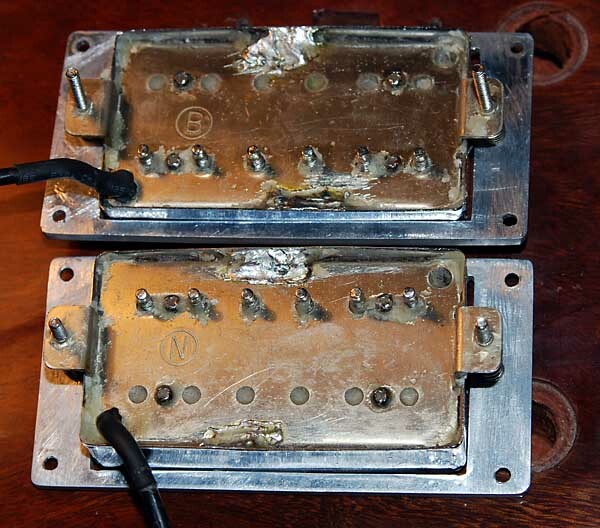 I pulled these pickups out of a 1983 Gibson Korina Explorer and must admit I've never seen them before. The wiring is Japanese and they both have a solitary stamp inside a circle on the base plate. One is stamped 'N' obviously for neck and the other 'B' for bridge. They do sound quite good but they are not from Tokai and I'm at a loss to figure out what they are. All help is appreciated. Can't say as i can help you other than to clean up the link to the photo's. Thanks for the help, brokentoes. How much would they read Peter? And yes, thay are japanese made, just see the hole on the corner in both meaning asian. By jove, Luis, they look exactly the same . . exacto. This Explorer needs some electrical work as it's all been messed with. For pickups I'm thinking Tim Shaw PAF and BurstbuckerII, and capacitor will be a Luxe .015 Bumblebee. Will post pics before and after. One thing that most people overlook with tone is moving the pickups away from the strings so the magnetic field is more open. Make sure the poles are staggered for an even volume across the strings. Add a good PIO capacitor and pots and you will create a tone monster. Glad to help you amigo!